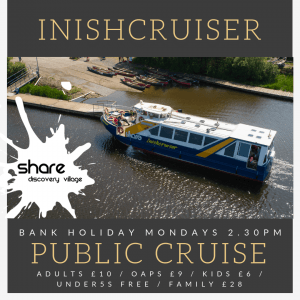 The Inishcruiser is a 57 seat, luxury heated Cruiser that offers boat trips exploring beautiful Upper Lough Erne. The fully licensed bar and catering service make it perfect for groups of all ages sizes, including birthdays, anniversaries, dinner cruises and group outings. You can enjoy the unspoilt beauty of Upper Lough Erne from the open air viewing deck. Cruises depart at 2:30pm from the Marina at the Share Discovery Village. This fully guided cruise lasts 1 ½ – 2 hours and meanders it’s way through the intricate islands of Upper Lough Erne. You will learn about the historic island community from Trannish Island, the Hara Krishna Community who live on Inish Rath, see the ancient Irish woodland at Reilly Wood, and view the plantation castle ruin and picturesque Creighton Tower on Gad Island at Crom Estate. You will also experience a wide variety of wildlife; deer, swans, Canadian geese etc. all of which we regularly encounter on our cruisers.